You were still nestled deep within my womb when I began to nurture, nourish and love you. Rod Stewart singing the song “Forever Young” always brought tears to my eyes then as it does even now. Feelings of love and emotions that were completely alien to me before you came into my existence. It’s been two years since the 10th of March 2009, the day you were born and time seems to have flown past and I fail to realize when you crept out of my arms, started to sit, crawl, walk, run and talk. You taught me so much about life and I still continue to learn so many new aspects each day as I see the world through your eyes. Your enthusiasm and zest for life is infectious and god knows from where your boundless energy comes from, since we hear from both our parents that your father and me were much more sedate in comparison to you. We continue to make amazing discoveries about you as you discover new things around. Your mischievous streak, your ability to be constantly on the move coupled with your difficult eating habits tend to tire me at times, but I wouldn’t have had you any other way! Your voice is music to my ears, your sight a feast to my eyes and your presence a solace to my soul.The way your eyes light up when you discover something new and your continuous interest and quest to explore life around you are a constant source of amusement and entertainment to everyone around and you cheer up the atmosphere with your antics, getting into your father’s shoes and literally trying to walk with them, playing with water, favouring my tripod, cameras and lens caps to your own toys. The way you screwed your nose at your first taste of ice cream and yet relished the taste of arugula lettuce on a sunday brunch with us are going to be permanently etched in my mind. I try to capture these moments, frame by frame, at times lucky to have them sealed for posterity and at times missing the most important ones. The best ones I some how tend to miss only to have them embedded deep within my heart. Of course there are moments of trepidation and doubt as there is no rulebook for parenting and one has to rely on one’s intuition and sense of judgement in tackling different situation that could have far reaching consequences and I hope that I’m right, at least most of the times. You are the best gift I have received from life and I hope to give you my very best, day after day. This has to be one of the best cakes to emerge from my kitchen, and I made two of these on his birthday on the 10th of March to be cut in the morning for a quiet family ceremony before the party in the evening. It is something that Harivansh relishes and I wanted to bake something simple this time, knowing that I will move on to more lavish cakes in the future. Although simple, I find this cake exquisite too and couldn’t find a better occasion to present this in front of you than my son’s birthday. Remember I told you about a cake that I packed for my brother and that I would share the recipe with you soon? I was talking about this cake. This cake happened to me by accident. One afternoon as I was all set to make my favourite eggless pound cake, I realized that some vital ingredients were missing. Then I remembered the custard powder cake. I did not want the custard powder flavour to be prominent so I made some calculations and wrote this recipe in my book. The out come was not only outstanding but my quest for a perfect yellow cake was also over with this experiment. 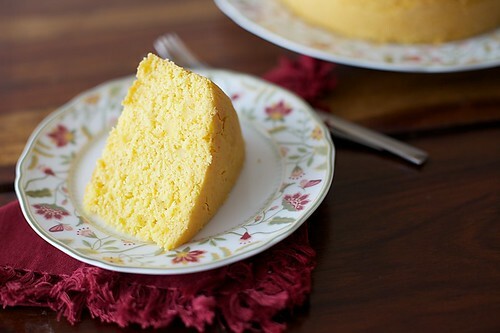 I am always awed by the gorgeous yellow cakes that keep making their appearances on the net but have never been able to try them out because of the eggs. Now, I don’t need eggs to get a good yellow cake. I have always enjoyed a bowl of custard made with custard powder. Custard powder was invented by Alfred Bird for his wife, who was allergic to eggs. You could substitute it with cornstarch but I suggest getting a pack of custard powder to replicate the colour and taste of this cake. This is also a fuss free recipe made with few ingredients and equipment. It reminds me in many ways of Dorie’s famous Swedish visiting cake. I have baked this recipe so many times and it has never failed me. It is also ideal when you have to quickly make something as it takes very little time to put together. Whether you eat eggs or not, you will love this cake! 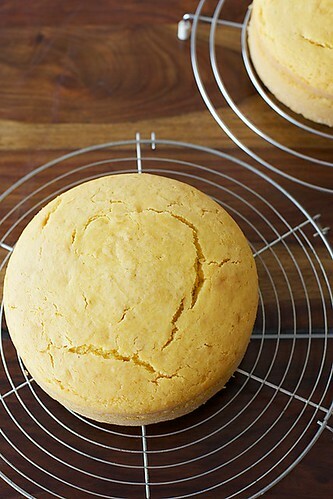 Prepare a 7” round cake tin by greasing it well with oil or butter and lightly dusting it with plain flour. Tap to remove excess flour from the surface of the pan. Alternatively, grease the pan and line the base with greaseproof paper. In a saucepan, heat the milk. Stir in the sugar and after it melts completely set it aside to cool to room temperature. After the milk reaches room temperature, add the custard powder and vanilla extract and mix well with a whisk. Put in the butter and mix again. Heat the oven to 160 degrees centigrade/325 F.
In a large mixing bowl, assemble the flour, baking powder, baking soda and mix with a whisk. Pour in the prepared milk mixture and mix well with a whisk until there are no lumps. Alternatively use an electric hand mixer/beater. Put the batter into the prepared pan/tin and bake for 55 minutes to 60 minutes, until a skewer comes out clean. *If using cornstarch instead of custard powder add a pinch of yellow colour and additional vanilla extract. Makes one 7” round cake. Very nicely echoed the feelings of every mom and dad. Topping it all was the cake..a very unique recipe for a cake for sure! I am a silent follower of yr blog and love yr recipes specially ur bakes and I am also into eggless baking.. My friends hv also tried recipes from here and loved them..
U hv so beautifully expressed ur feeling 4 ur son.. I am sure he will be so glad to read this when he grows up.. Btw, I was just wondering why u hvnt put a face pic of ur son.. would love 2 catch a glimpse..
Love this recipe of custard cake.. Bookmarked and will try it soon for sure. OMG ! I can't tell u how excited I was when I saw this recipe. 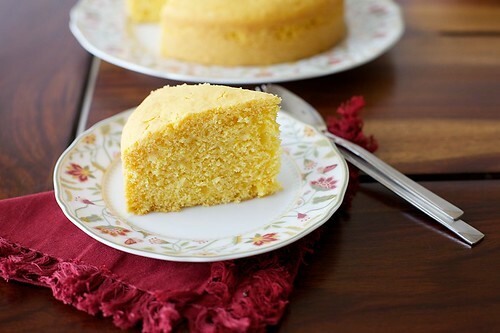 I've been searching all over the web for an eggless yellow cake, can't wait to try the recipe. Anu do you have a recipe for a white cake as well? 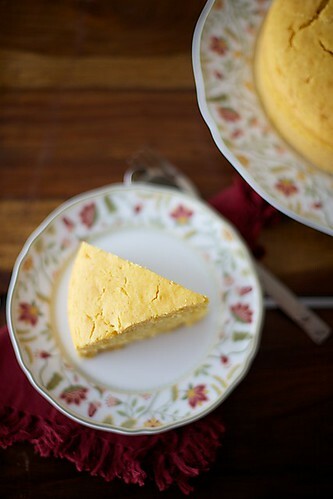 Love this simple recipe which seems perfect for my eggless cake needs. Can't wait to try this! Thank you everybody, I'm so happy you are all loving this! Jyoti: Thank you for chiming in…I love to get feedback and I'm so happy divinetaste is of use to you and your friends! You know I adore your Cake recipes and more often than not,those are the ones I try whenever I bake for my parents[who don't eat eggs]and always are such big hits.Love this absolutely. 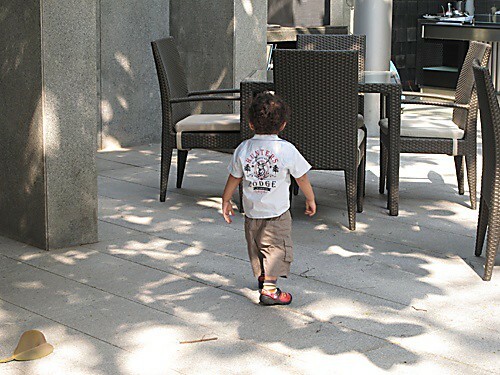 Love Hari's pics too..he's a cutie! looks lovely Anu….I especially love the sponginess of this cake and its almost unbelievable that its eggless. 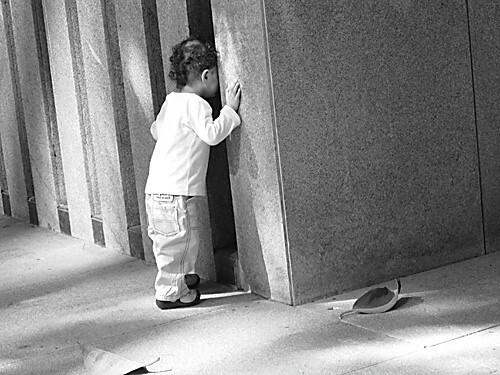 Love the pattersn on the plate…Love the way you have shot the little one…he is there all over the page…yet one can never see his face….Cute the way you have almost played "peek-a-boo" wth us!!! Enjoyed reading your tribute post to the little one, shots are awesome too. This post really resonates with my thoughts esp. 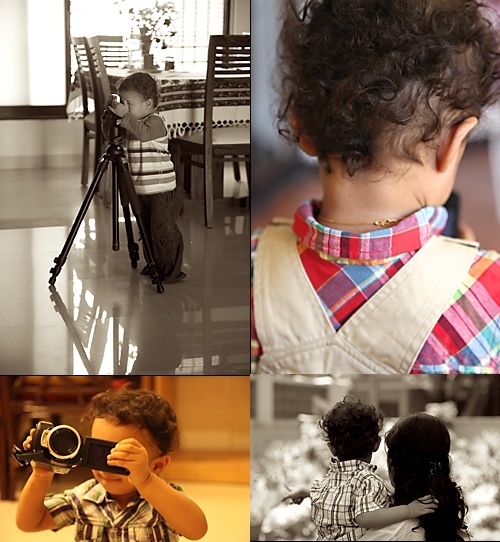 for the love of children, baking, photography. I am not a fan of custard or corn starch per se, but the love you as a mother have put into making this, puts a totally different perspective in my mind and made me want to try this for my little one. Bonus is that its eggless as I am not comfortable cooking with eggs being a vegetarian. Divya: Yes my dear…I know how you love these cakes and I'm so thrilled that you and your family relishes them. Priya: Yes…it is a very fuss free cake. bunny mum: You won't be able to taste the custard powder or cornstarch at all in the end product. So go ahead and bake this. Hope your little one loves this. Would love to hear from you about it. Good luck! I posted my version of the original recipe on my blog recently- I was not at all happy with the texture of the final product. I thought the custard powder made my cake rather dry. You cakes look great and your pictures are very beautiful! I am an enthousiastical follower of your blog since some months (I found it by accident by doing a search in google for carrot halwa) and I truly love it. First of all your writing style is really beautiful and goes straight to the heart, your pictures are great and your recipes are a true inspiration …they have opened a new world of vegetarian cooking for me. I wanted to take this occasion to send you congratulations with your son’s birthday (he is almost the same age as my second daughter), you have expressed very well and very beautifully the univeral feelings of mothers for their children, reading your post put tears in my eyes…. Thank you for this great blog, I think it must cost you a lot of time and effort but it is worth it, as the result is just beautiful! I made cupcakes using this recipe, they were quite delicious! Thank you so much for sharing, and your son is beautiful! Iam a silent follower since a long time of this blog n your food pics are just awesome,they show the artistic side of youself. loved this reccipe and will try it for sure.looks so soft n yummy! !my son will turn 2 next month,so i guess i know which cake to bake for him. The cake looks fantastic. The post is beautifully written. You know your son looks a lot like my first son 🙂 The photos of your son instantly brings a fondness in my heart 🙂 My belated wishes to the cutie pie. Marian: Thank you so much for writing and telling me how you feel about my space here. Its wonderful to hear from you! M: Love to hear from silent ones like you. 🙂 Congratulations on your son turning 2! Hope you will love this as much as I do. You could pass off as one of the BEST FOOD BLOGGERS IN THE WORLD. Thats choooooo chweeet!!!!!!!! 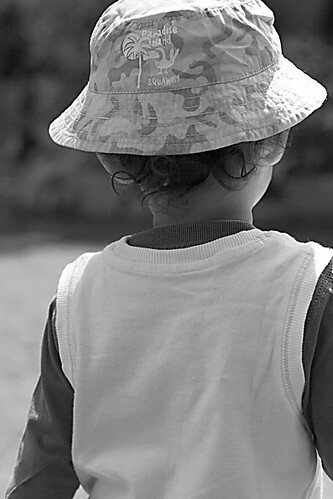 how I wish I could c his face….but anyways…..wonderful blog this one is worth treasuring because it is written by a mother….really GR8 keep it up. I'm making this cake right now, I've got up to the part where I've added the butter in the wet mixture and it has become completely lumpy, was the butter supposed to be melted? I live in London so our butter is quite hard so I left it at room temperature before I added it and it's a bit of a disaster! Sonia: Don't worry. Once you mix in the dry ingredients and mix and then bake, it will be ok. It is a good idea to always bring the butter to normal temperature before you bake. If you have the butter in the refrigerator, leave it on the kitchen counter for an hour or two before you bake. What a beautiful tribute. I love it. The photos are precious. And the cake …divine. I have recently relocated to Mumbai. I love your website. I had a question about the kind of butter to be used in cakes(salted or unsalted? ).Unsalted butter is not easily available. Is it possible to replace butter with equal amount of oil. Please help. Lokks really good , love the soft texture will book mark and try. Richa: Replacing oil with butter can affect teh texture of the cake in some recipes. There are recipes of many cakes with oil. I have used both unsalted and salted butter and using salted butter when there is no alternative is ok. It doesnt make any difference in cake and lends a slight salty sweet taste to icings. Wow this cake looks incredible. I've been taking professional cake decorating classes and needed a recipe for a basic eggless cake (since i'm veg)…I think this will work perfectly with buttercream icing. I'm going to make it a layer cake with strawberry jam in the middle. I'm making it today and will for sure let you know how it turned out. Wonderful recipe. I tried this today and it came so well!! Do you add the vanilla extract or not while mixing the ingredients? I see it in the ingredient list and not in the preparation. I went ahead and added the extract and my cake turned slightly brown in color. Bavi: This is one of my favourite recipes and I'm glad you like it. I do add the vanilla extract. Have made the required edits. Hey Anu, words arent enough to thank you for this recipe!!!! You have a great site and have tried out a few recipies especially the cheesecake. They were very good. I tried out this cake with oil as I hardly ever use butter in my cakes. I think I had unrealistic expectations but all said and done it was a good basic cake. Chitra: It would have tasted good I'm sure…only the oil would have given it a dense texture as other ingredients in cakes make with oil to make it fluffy are missing here. Wonderful collection of recipes you have got. 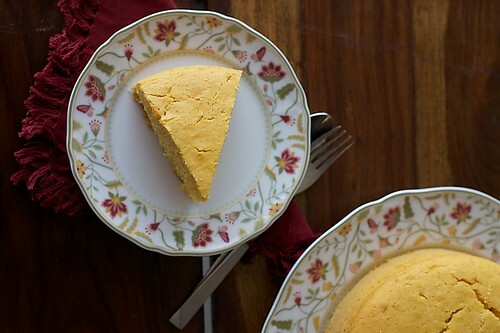 I have tried you radish-green curry and now this basic eggless cake. Its baking inside my oven and I already smell it wonderful! My parents are here now and that gives me an opportunity to try out an eggless cake. Thanks a lot. Pria: Wonderful! This would keep for 2 days at room temperature and about a week when refrigerated. Don't know how it would fare in international shipping! thank you so very much for your help.cheers. Lovely tribute, i feel it too with my son who is already 10 months time flies..
Lovely post and breathtaking snapshots. Your son is a cutie. God bless him. I have made this cake today for a friend's B'day. I'm sure she'll like it. Thank you. @Mani, @Garima: Thank you for your nice words! Had bookmarked this cake since ages! Finally made it! An amazingly crumby cake. My Mom who is very critical of my baking generally, loved it! Added a touch of saffron in it, smelled lovely. I am planning to make an egg less cake for my son's first bday. I plan to bake a 2 tier cake(yellow cake and the chocolate cake). It would be a great help to me if you could suggest the proportions for the yellow cake for a 9 inch pan. This cake was a hit with my family. Also if you could advice if chocolate cream cheese frosting would go well with the yellow and chocolate cake in between the tiers. Thanks in advance. Richa: Nice to know that this cake was a hit with your family! For a 9" pan, use this recipe + halve the recipe i.e 1 1/2 times. I think chocolate cream cheese frosting would go very well here! I bake a lot but for my grandmother's 75th birthday party I want to bake an egg-less pineapple cake as she doesn't eat eggs,I think your recipe would be perfect as I always want a cake which tastes good even without any frosting. A quick question though- I am thinking of using pineapple custard powder instead of vanilla as I want to make a pineapple cake. Would it work out fine in terms of texture and flavour? Or should i just use pineapple essence? I have tried out many recipes from your blog now – the banana bread, the eggless vanilla cake, the eggless chocolate cake, this golden yellow one. Each and every one of them has come out so well and tasted wonderful!! I have gotten rave reviews from every single person who ate this. In fact although I have trying to 'bake consistenly for the last one year, it's only after i stumbled upon your site that i have tasted success each and every time. I had been planning to bake one of your cakes for my daughter's birthday this time and was determined to frost the cake as well (my first time in frosting). I tried out the eggless vanilla cake and although every one loved the taste of that, i felt that it was not crumbly enough and people would always tell me 'oh, it's eggless, that's why it's not crumbly.' So then i read this recipe and i thought it would be perfect and really it was!!!! I made two 9" inch cakes, using 1 and 1/2 quantity prescribed for your 7" cake. And it worked so well…. I frosted it with your chocolate buttercream frosting and then we decorated it with a yellow duck for my daughter's second. We had a party for 30 people yesterday and everybody was full of praise and I believe I have converted almost 3 to 4 people from baking in a microwave oven!!! I use an OTG.. Thank you so much for sharing these recipes with us. You are most generous with your time and talent and I'm aware of how precious the time must be to you.. as I have a daughter who is about 6 months younger than your son. Harini: Thank you for taking the time to express your heartfelt sentiments! I really value them and it inspires me a great deal! Happy birthday to your daughter! NSJ: So happy you decided to make this cake and loved it! I truly appreciate it that you report your success each and every time. I'm glad to be able to help anytime and thanks for chiming in and joining the conversation. I use an otg, but whatever I do, my cakes dont crack on the top like the ones in all your pics. The texture and all is fine, but once the cake cools, that is the next day, the upper layer feels sticky and a bit like eating undercooked cake mix. Mind you, I keep it in for the prescribed time and temp, the works. Nivedita: Thanks for your kind words. Are you taking out your cakes from their tins after a few minutes once they are done? If you leave them on they might become sticky. As far as the cracks go, it also depends on the recipe, the flour to baking powder/soda ratio, etc. Try this recipe and let me know how it works for you. lakshmi: Nice to know that you had success with this recipe and everyone loved it. 🙂 Hope this will inspire you to make more dishes. In the step where we have to heat the milk & add sugar, do we add sugar while the milk is on stove or after switching off? I added sugar while it was heating & the milk looks watery. Kavi: You need to add the sugar while the milk is heating and turn off the heat only after the sugar melts.The milk does look watery at this stage. Each oven is different. Generally this bakes well at 160 degrees centigrade for the time given above. The crust starts to brown if the sugar is in excess or is not mixed properly. I was excited to try this recipe. I wanted to bake a two layer cake with chocolate fudge frosting. The cake came out too moist and heavy/dense. I made a mistake while making it. I forgot to melt the sugar in the milk, and instead just mixed it in with the flour. Could this have been my issue? Does the sugar have to be dissolved in the milk for this recipe to work properly? Kristi: You have to accurately follow the recipe in baking to get the desired results. What you have done is completely alter it. It is crucial to mix the sugar into the milk in this recipe. Please try it again following the recipe and see the difference. Thank you for the amazing recipe! I tried it out today – twice to be precise. In the first one, i assume i added a little too much butter, because eventhough the colour at the bottom is perfect it was very greasy and oily. The cake tasted good but was dense. the second batch had a little less butter and I kept it on for longer on the stove (I did not use an oven). It was perfect. Still a little dense though. could you tell me why? I followed all the instructions perfectly. Deeksha: This recipe is not meant for the stove top. If you bake it in an oven you will get good results. Meenal: Thank you for your feedback. You add lemon zest, maybe a teaspoon of it. It will just give it a lemony flavour and won't alter the texture or the outcome of the cake in any way. Thank you for sharing this wonderful recipe. Made it for my Mom's birthday and she loved it as did everyone else including me. I loved the concept of a vanilla cake with which you can pair up anything and expect it to be delicious. I made an apple jam to go with it and it tasted absolutely wonderful and amazing. My brother applied nutella on it and relished it. Thanks once again!!! Ankita: Yes..this is a versatile cake indeed and always a winner. So good with jam or nutella! thanks a lot for this recipe. i have tried cakes n number of times but every time i encountered a so so output. either the recipe called for heavy amount of butter or condensed milk to compensate for lack of egg. but this recipe looked different and i tried only to get soft porous cake. thanks a lot. I do however mix the "custard powder"- the closest here is pie/ pudding filling- with the other dry ingredients and get a much moister cake. Just noticed the difference after trying both ways for a few times. Or maybe the difference is in the custard powder we use- anyway- THANK YOU so much! thanks to your recipe i've finally been able to make that typical golden, vanilla cake i've always wanted. my husband loves it, and it turns out perfect everytime! 🙂 thank you so much. everytime i bake it, the center rises a lot and splits open, do you have any tips for me to get a nice, even top? Wow just wow. I stumbled upon your blog via your facebook page and absolutely love your recipes. Especially this beautiful cake. tanvi: Looks like you are using a small tin. Try using a bigger tin and you wont have that problem. my first ever eggless cake , turned out a beautiful yellow . tho the next time i would add a bit more sugar..otherwse thumbs up! Mamta: Are you sure you measured the sugar properly? You are supposed to be using granulated sugar and not fine sugar. This cake has a proper level of sweetness and is not just about sweet but if you want more sugar feel free to increase it. Probably for nth time i am doing this cake. but this time i made for special occassion. I made it as a prasadam on wonderful satsung which gave me immense satisfaction. never before did i imagine that i can make a cake without tasting it. my heartfelt thanks to you. Vasumathy: That's so wonderful to hear! i have a question…the total amt of four will be 2 cups that is plain flour and custard powder and amount of sugar will be 3/4 cup….but i guess for our taste buds the amt of sugar will be less…so can i add one and 1/2 cup of sugar? 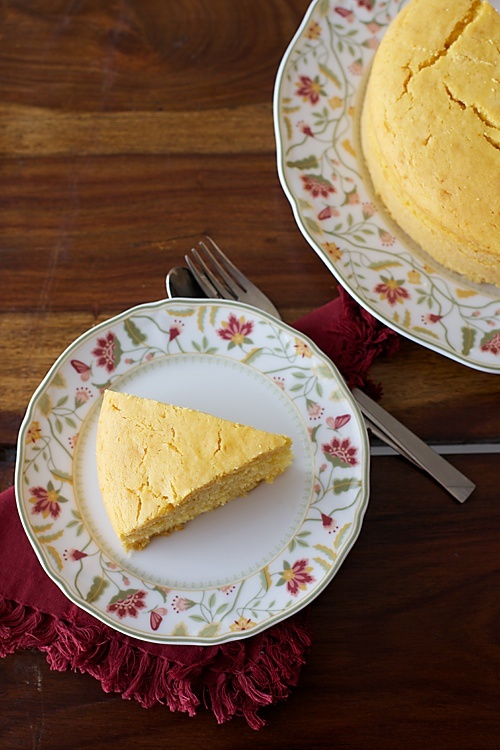 I came across this recipe looking for eggless yellow cake. This cake came out so so good. Perfect texture and delicious! I didn't have baking powder at home so I made the following changes. Added 3/4tsp baking soda instead of 1/4tsp as stated in the recipe. I also added 1tsp of freshly squeezed lemon juice to compensate for the citric acid that is in baking powder. Aparna: All the best for your future baking ventures. I tried this and it came out really well! The texture , taste all was ok but my cake dint rise as much as urs in the pic? I've just started baking what mistake could I have made? Prarthana: Did you use the right size tin? Other than that I would suggest you to weigh and measure your ingredients properly for baking. Less leavening agents also will not allow the cake to rise. I just 2 days back got to see your site and i am so happy to be here. I tried this yellow cake and it turned out very nice. Thank you very much for the nice and detailed presentation. Every one enjoyed this cake. Thank you once again dear. Just striked to your page today while searching for baby food . N absolutely loved it. ? Not just the receipes but also the stories n thoughts behind each recipe . Have checked out so many recipes in a single day nwant to try infact can't wait to taste .;-). Also absolutely loved the way you have shared your thoughts bout your son, it felt as if I m reading my own heart. jahnu: Welcome to divinetaste. Look forward to hearing more from you. I baked this for my nephew's first birthday and it came out soooooo well! Everybody relished it. I am a silent follower of your blog and really like all your recipes. I too belong to the culture where we do not eat onion and garlic as well as eggs. So, this blog is like a jackpot for me. I tried this golden cake 1 week back and it came up really well. But when I tried it yesterday, it came out to be so hard that we could not cut it. The only difference that I had made was that the one that I tried earlier, I used Custard powder, but as you had written that we could use cornflour instead of custard powder, I used the cornflour powder and the results were really disappointing. Hope I have a better luck next time. Richa: I hope you used cornflour as in cornstarch which is very fine in texture and not the coarse variety of cornflour. Hi, I dont have a 7" round pan..how can I alter the ingredients quantity according to 9" pan? Ushodaya: You can use a 9" pan but you wont get a good height, the taste and texture would be the same. Hi 😀 Love to know there's an easy recipe that I can make for potluck! If I use a convection oven, will the temperature be 160 degrees C or less than that? Please guide! Zim: The temperature would be the same. Good luck! Made this cake today. It was the easiest and hardest cake I have ever made. easiest because, its so easy to put it together, few ingredients mix together, bake and done. hardest because, I decided to follow your instruction about not opening the oven door every few minutes, so those 30 minutes were very looooooooooooooooong. Cake is supersoft, superyummy, moist and delicate. Thank you very much. Great recipe. I'm not much of an avid baker and I tried this and it turned out well. Substituted brown sugar for half of the sugar in the recipe for some added flavour and it was good. Charlene: Brown sugar in this cake sounds very good. This cake appears to be reasonably firm, to hold up to little heavy frosting. which hold the frosting inside the cake. Please, do share your recommendation, as I'm looking for an egg free cake from a long time, to work with these pans. It would be really helpful… as I want to make this cake for my kids' upcoming b'day. Devasena: I think it will work. Good luck! Nikita: Try using unsalted butter. I like to use lightly salted butter here. Hi can u help me in how to get an unsalted as in which brand provides unsalted butter thank u. .
Nikita: Depends on where you live. You can get unsalted butter from local brands. Or else try international brands like lurpak which are exorbitantly priced but available in any big supermarket stores. Can you please, suggest the ratio / proportion modifications to be made to the above recipe for a 9" chocolate cake… as I want to make 2 9" cakes for an upcoming birthday and would want to make one as-is and the other one as chocolate… flavor. Devasena: This recipe actually makes a 7 or 8" round cake or 12 cupcakes. For a 9" pan all the proportions would change, but you can still make it only the height would be less. For a chocolate cake replacing 1/4 cup flour with 1/4 cup cocoa powder. I love your blog,but I wish u we post some low fat ,eggless recipes for those of us with health concerns.how can I replace the butter with oil.Thanks! Shromani: Thank you for your interest. I do have many baking recipes made with oil instead of butter. Do check my recipe index. Look forward to hearing more from you. I made the cake yesterday, it was very nice, every body liked it. Inside the colour was yellow, but outside was brown. Any suggestions to improve next time. SAdhna: Did you overbake? MAybe you can reduce the temperature a bit! … for the wilton specialty pans for which I intend to use this recipe, the recomended height is as per the 9" pan. please, let me know the proportions of ingredients for the above cake for 9" pan. Devasena: You can try doubling the recipe. The batter should not cross the 3/4th mark of the pan. Hi, this is a very good recipe. Thanks for sharing! I tried out this cake.The colour and taste were great,but My cake split open when I set it to cool after removing it from the oven.I followed your directions exactly.You said in one of your earlier posts, to a similar problem that may the tin was too small;But I used the right size tin as mentioned by you.How can I rectify this situation.Can I add a little extra milk,maybe 1-2 tbsps? nivedita: Great to know that! viji: I have a video for this cake. Maybe you can watch it. Hi anushruthi, thanks for the recipie. I tried to bake the same way and took it out after 1 hr. After cooling, when I tried cutting, the inside is breaking apart. How to avoid this? Also the crust is Brown and not yellow. Please help. Archana- Please see the video of this cake, maybe it will help you? Without knowing exactly what you did, it becomes a little difficult to answer. You can also check out my baking FAQ! Tried this cake and it came out very well…I basically have a doubt.You told we should put 250ml of milk, but if we put 500ml then should the quantity of other ingredients should be doubled including baking soda and baking powder? Kindly clear my doubt…. waiting for your reply…. Hi anushruthi, I've been a follower of ur blog for quite sometime now. Tried many recipes, especially cakes and cookies which turn out to be huge hits among friends and family. 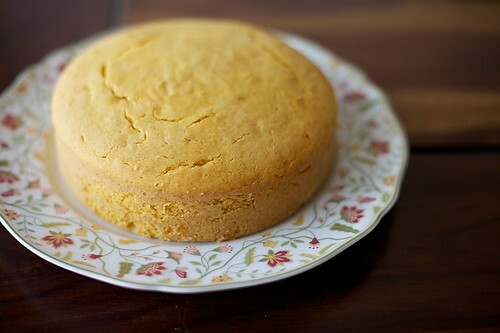 Baked this golden yellow cake at tea time today and it turned out perfect with great texture and taste. I've used cornflour so mine didn't get that golden yellow color and I'm not complaining at all. Thank you so much for your wonderful blog! Pooja- Thank you for your kind words. Glad you enjoyed this cake…it is truly one of the best out there! I made this cake today, it is very delicious. I cannot not believe it is made without eggs! Shawna= That's what most people who make/eat this cake say! So glad you like it! hello maam. I tried this eggless golden yellow cake. My family just love this cake…easy to make and very tasty… thank u.
Sweta- Am so pleased to hear that! Hi.. lovely blog Anushruti.. I was wondering how this would turn out if I used choclate flavoured custard powder..Do you think I should add some cocoa powder also? TO get a chocolate flavoured cake that is..
Gayatri- You can give it a try. If you do, let me know how it worked! Hi Anushruti…love your cakes…being a vegetarian ..
Shalini- This is a rich, buttery cake. If you are looking for a lighter cake, try my eggless vanilla cake. Hello Anushruti, I recently baked the banana bread with choco chips from your recipe and oh my god! It was absolutely amazing. My friends were going crazy about it. Thank you so much! I've been wanting to try this recipe but I want to bake a little bigger cake. How do I increase the measurement of ingredients? Can you please help me out? Also, how does one generally alter the measurements for baking larger size cake. Amit- Glad to know you enjoyed the cake. You can double the ingredients and use a bigger pan. You will have to increase the baking time by a few minutes as well. Hi Anu, i baked this cake yesterday n it turn out superb..but its a bit crumble. Any idea where it gone wrong. Sharon- This is not supposed to be a crumbly cake. A cake is crumbly when too much sugar is used or if there is not enough of liquid for binding the dry ingredients. I just made this cake today for my daughter's second birthday. She is highly allergic to eggs and I have struggled to find a good recipe. This one was fabulous. It made 18 cupcakes and I only needed to bake them for about 15 minutes. Bethany: Thank you so much for the feedback. Yes, it takes about 15 to 20 minutes when made into cupcakes. I made this cake today in cup cake format for my son. Taste, texture wise they are perfect, also I added chocolate chips for additional taste. I followed your instruction an=d measurements to the T. But the milk, sugar custard powder when mixed with flour, Bp, bs mix made a super lumpy mix, which had me worried about cake. What can be the reason? The custard was perfect, to my eyes but next time I will give it a whisk in mixer(dont have a hand blender) then fold in the flour. You need to whisk the mixture properly to remove the lumps. If you dont have a hand blender, use a whisk and whisk the mixture nicely to remove the lumps. You do it by continuously rotating your hands with the whisk until the batter is smooth.